It has been kicking around since 2011 yet has only just saw a cinema release. I thought the trailer was poor and I was so sick of home invasion films that I only went to see it for my blog, in fact just before it started I sent a friend a text saying I did not want to be there. Still despite my tiredness and apathy I decided to give You're Next a chance. Warning, there be slight spoilers ahead! Crispin Davison (A.J Bowen) and his Australian girlfriend Erin (Sharni Vinson from Home and Away) arrive at Crispin's rich parents house out in the country along with his brothers and sister to celebrate the parents wedding anniversary. During the anniversary meal the home comes under crossbow attack from outside by an assailant wearing an animal mask, after more violence it is revealed that there is also an invader already in the large house. With their cars disabled and a mobile phone jammer stopping any calls made the survivors must find a way to get help before all are slaughtered by the merciless killers. This film is freaking awesome! My expectations were so low and at first it all seemed justified. It starts off like any other film of this type, though the Davison family are quite dysfunctional and all seem to have grudges with each other. There was a vein of humour that is odd for home invasion films but still I was prepared for tradition. The initial attack leaves the family panicked and it is quite tense until the hilarious moment a character nobly runs out the house to get help (in slow motion) and is immediately killed by a piano wire. 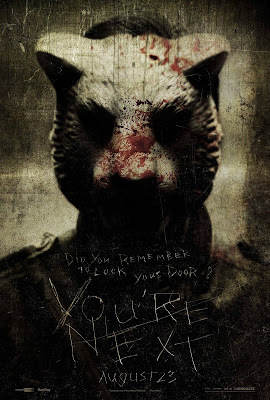 You're Next is laugh out loud funny, and I wasn't the only one, the entire cinema was laughing at points in this film. The douche brother Drake walking around with an arrow stuck in his back, the sarcastic comments the group say to each other, and the bumbling antics of the invaders are all so funny and fresh feeling without being over the top. Usually invaders in these films are emotionless husks but here they make a lot of mistakes and get into Home Alone levels of ineptitude thanks to main lead Erin whose hidden survivalist background makes her more than a match for all the attackers combined. She is a very strong female lead and a joy to watch as she is hyper violent and awesome. Many times the invaders are humorously repelled thanks to her efforts via a variety of methods. The second I saw her beat someone to death with a meat tenderiser was when it really felt the tables had turned and she at least would survive. So used to seeing scared hero's just trying to survive that it is refreshing to see someone not holding back. Overall it combines genuine horror and violence with a rich layer of comedy that came out of nowhere and is never over played. I was taken aback by just how much I enjoyed this film, left the cinema with a big grin on my face, fun, is indeed fun and shows their is still life in the home invasion genre.